What happens when you spend all your time on the water and you witness firsthand the negative effects humans have on the ocean? It makes sense that you would do everything you could to solve those problems in any way imaginable. This is exactly what Harvey DeMovick IV, an 8th grader at Pine Point School in Stonington, CT, started doing at a very early age. Harvey’s been passionate about the ocean and all the marine life that exists below the surface since attending Sea School at the Mystic Aquarium in Mystic, CT at the age of 4. At that time, Harvey’s hero was Dr. Robert Ballard, an underwater archeologist most well known for his discovery of the HMS Titanic in 1985. When Harvey was very young, he had the opportunity to meet Dr. Ballard and he recalls discussing tubeworms and other deep-sea discoveries with the world-renowned scientist. A few years later, Harvey began sailing on his own and at a very high competitive level. His career began when he was 6 in Westerly, RI, and he settled on mastering the Optimist. A year later, Harvey won his first trophy. At age 8, he joined the Eastern Connecticut Sailing Association (ECSA) and made a name for himself by sailing at all the local yacht clubs, no matter how hard the wind was blowing. Harvey had many accomplishments over the years, including placing first in the 2017 ECSA Junior Championship. In 2018, Harvey decided to use his talents and time sailing to support Sailors for the Sea, a Newport, RI-based ocean conservation organization dedicated to educating and supporting sailors to make a difference in the world. Harvey was competing at a high level, participating in many races in local and national regattas. He decided to use his time on the water to help raise money and awareness at every race he competed in. 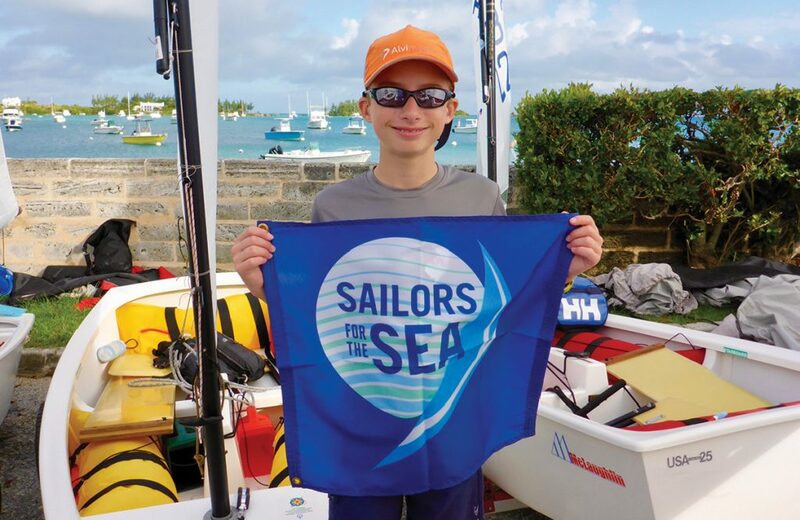 By the end of the 2018 season, Harvey had raised over $4,500 for Sailors for the Sea with over 50 sponsors. Harvey has now competed in several national regattas with some of the best Opti sailors from around the United States. This past November, Harvey competed in the 2018 USODA Allstate Optimist Midwinter Championship in New Orleans, LA and placed 34th out of 236 competitors. Harvey’s performance earned him an invitation to join the United States Optimist National Team. In February, Harvey and 14 of his teammates represented the United States at the 30th International Palamós Optimist Championship in Catalonia, Spain, in which he also represented the New England Science & Sailing Foundation. In addition to sailing, Harvey is working hard at school. The theme for this year’s curriculum is about sustainability, and the food and water we consume. Harvey will continue to raise money for Sailors for the Sea by asking his classmates to give to this organization and be conscientious about how every day plastics can affect the oceans. As he gains recognition for his efforts on the racecourse, he hopes to send a message about preserving the place he loves to spend his time. You can make a difference. Follow these steps to create a positive future for the ocean. Reduce single-use plastics in your life. Plastic bags, straws, water bottles and flatware can easily blow away and end up in the waters we all love to recreate on. And all of these items can be replaced with reusable ones. Spread your passion for protecting the ocean and why it’s important to make sustainable changes in your everyday life to your family, friends and classmates. Donate to Sailors for the Sea to help educate and activate the sailing and boating community toward improving ocean health. Susan DeMovick, Harvey DeMovick IV’s mother, contributed to this story. This Sailors for the Sea Ocean Watch essay is reprinted with permission. Special thanks to Shelley M. Brown, PhD, Sailors for the Sea’s Education Director, for assistance with this story. For more information and to join the race to restore ocean health, visit SailorsfortheSea.org.